This term may thus allow politicians and donors to maintain a ‘business-as-usual’ mode by accepting the idea of neglect as an unchangeable paradigm, dampening the drivers behind political impetus and funding. The quote from a SORT IT participant was illustrative ‘I hoped to do my PhD on intestinal worms, but I was quickly dissuaded by many in academic and government circles saying it is a neglected disease’. The Amharic (Ethiopian) translation of NTDs reads ‘Tropical diseases needing special attention’- an empowering designation with an imperative for action which reflects the mind-set change that is urgently needed. Second, the 15 years of naming this constellation of diseases of poverty as ‘Neglected Tropical Diseases’ have not really changed the paradigm, as we have only kept adding to the list of NTDs with none coming off permanently.6 7 This is proof that much more is needed to eliminate NTDs, including clear objective criteria for getting on or off the list. Furthermore, since being removed from the NTD list may be a disincentive for continued funding support it may encourage passiveness. Bringing NTDs into the SDG agenda is laudable, but strong activism and political momentum is now urgently needed.8 HIV/AIDS is a good example. The ‘3 by 5’ initiative, launched by the Joint United Nations Programme on HIV/AIDS (UNAIDS) and WHO in 2003, was a global target to provide life-prolonging antiretroviral treatment (ART) to three million people living with HIV/AIDS in low-income and middle-income countries by the end of 2005.9 This was followed by Universal Access targets, the Treatment 2.0 Strategy and the UNAIDS 90-90-90 treatment targets. All of these were important drivers that simplified therapy, increased treatment coverage and crystallised the necessary environment for the establishment of operational and programmatic components for an expanded and sustainable global response to HIV/AIDS.10 From hundreds on ART in 2003, the result was 21.7 million on ART by 2017.11 Such initiatives reached fruition because of a public health approach to ART scale-up as part of Universal Health Coverage (UHC). It is time to gear similar political and funding impetus towards NTDs. Since the NTD package includes a diversity of diseases, the role of disaggregated or appropriately combined treatment targets may help. Third, the list of NTDs is diverse, with parasitic, bacterial, viral, fungal infections and snakebite envenoming.3 Unlike diseases such as HIV/AIDS, TB and Malaria, there are practical difficulties in building strong communities of practice, as NTD work is often confined to silos of specific diseases.4 While recognising the specificities of each condition, new ways of building an integrated approach that compels stake holders to look beyond ‘the trees to see the forest’ are needed. The WHO Roadmap strategy on control, elimination and eradication of NTDs is commendable, but it is geared only until 2020 and urgent work is needed to align it with the 2030 SDG target.8 11 Importantly, the road map is largely focused on the diseases for which medicines and large-scale prevention and treatment options exist, such as for onchocerciasis, lymphatic filariasis, schistosomiasis, soil-transmitted helminths (STH) and trachoma.12 Implementation of large-scale prevention and treatment is often hampered by shortages of drugs and vaccines which needs to be addressed. Vector control activities are also required for vectorborne diseases, such as dengue and leishmaniasis, while veterinary public health as part of the ‘One Health’ approach is needed for zoonotic diseases, such as taeniasis/neuro-cysticercosis, echinococcosis and rabies. The provision of safe water, sanitation and hygiene (WASH) is another key component of the WHO strategy to overcome NTDs such as trachoma and STH. These interventions, and how they are integrated into broader health systems and within the principles of UHC, are spelt out in the WHO’s 4th comprehensive Report on NTDs, but in contrast to tuberculosis and HIV/AIDS, this lacks clear and measurable targets and milestones by which to judge progress.13 If we are to eliminate NTDs by, 2030 the ‘how to’ of this gigantic task needs to be defined including milestones and targets. Similarly, there is an inverse relationship between commercial market size and products in the R&D pipeline. NTDs lie towards the bottom of the pile (figure 1).15 A 2018 TDR publication drew attention to the fact that the current R&D pipeline is dominated by three diseases—malaria, HIV/AIDS and tuberculosis. 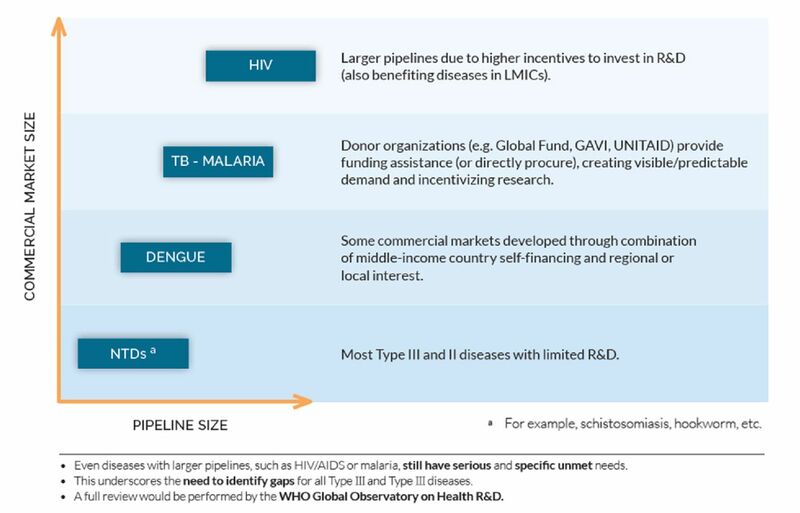 For NTDs, 12 (57%) of 20 NTDs have nothing at all in the pipeline (figure 2).16 This finding reiterates the need to establish a new funding model for NTD-related R&D and the need for national and regional investments. Africa is the continent most affected by the NTD burden, but contributes less than 1% to global expenditure on R&D.17 The BRICS (Brazil, Russia, India, China and South Africa) and G20 countries have an opportunity to show leadership in addressing this challenge. A possible way forward is to call on G20 countries to generate a special fund for NTDs since the NTD burden is highest among the poor in G20 countries (together with Nigeria) and they have capacity to develop generic products. Furthermore, NTDs are pervasive wherever poverty and vulnerable populations exist, including emerging market economies.18 If these countries would effectively implement NTD programmes, a large proportion of the NTD burden would be resolved.7 18 NTD endemic populations are the least likely to be able to meet SDG targets that include UHC (target 3.8), safe water (target 6.1) and sanitation (target 6.2) and as such they can serve as tracers of equity in progress towards the SDGs. Impact of market on product pipeline (diagnostics, drugs vaccines) starting from the preclinical stage for various diseases.15 Type II diseases: are incident in both rich and poor countries with substantial proportion of the cases in poor countries.15 Type III disease: are those that are overwhelmingly or exclusively incident in developing countries.15 NTDs, neglected tropical diseases. 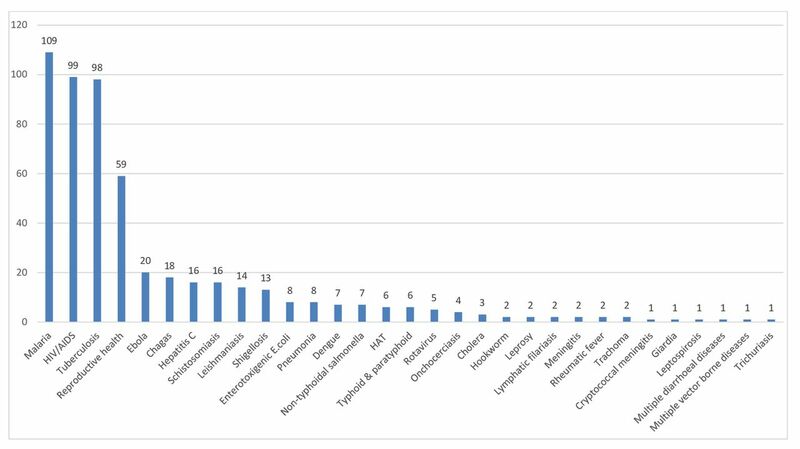 Number of candidate products (diagnostics, drugs vaccines) for neglected diseases, by disease condition in 2017. Reflection on how existing global funding mechanisms such as the Global Fund Against AIDS, TB and Malaria (GFATM) could also embrace NTDs as part of their portfolio is needed more than ever before. From an operational perspective, this seems logical as areas endemic for NTDs also tend to be endemic for HIV/AIDS, tuberculosis and malaria. Coinfections with STH and schistosomiasis are also known to exacerbate the progression of the aforementioned diseases.19 A promising way of pushing the NTD agenda and leveraging political attention and resources would thus be an integrated management approach to NTDs, Malaria, Tuberculosis and HIV and a call for public health action at a broad level in countries. Such an approach would also strengthen the general health system with benefits to the management and control of NTDs. When new drugs are developed for NTDs, they need to be deployed at programmatic level as quickly as possible, and here the funding support from GFATM for operational research would facilitate a win-win situation. Whatever the eventual choice may be, articulating the mechanisms for funding remains a glaring gap. In conclusion, in countries like Ethiopia how well we do with NTDs could serve as ‘tracers of equity’ towards the SDGs and markers of the philosophy of ‘leaving none behind’. We must succeed, but that will depend on the backing of a supportive political environment, coupled with new science, funding (particularly by G20 countries) and robust advocacy. Most of all, we will need a greatly strengthened sense of global solidarity focused on the needs of the poorest and most vulnerable and with the participation of all countries, all stakeholders and all people.4 If we are to transform the NTD world for the SDGs, it will require us to first transform our thinking and actions.
. Transforming our world: the 2030 agenda for sustainable development. Available: http://sustainabledevelopment.un.org/post2015/transformingourworld [Accessed 18 Sep 2018].
. Why are some tropical diseases called "neglected"? Available: Available: https://www.who.int/features/qa/58/en/ [Accessed 12 Oct 2018].
. UNAIDS data 2017. Available: http://www.unaids.org/sites/default/files/media_asset/20170720_Data_book_2017_en.pdf [Accessed 11 Oct 2018].
. Investing to overcome the global impact of neglected tropical diseases. WHO third report on neglected tropical diseases. Geneva: WHO, 2015.
. A roadmap for implementation. accelerating work to overcome the global impact of neglected tropical diseases. Available: http://www.who.int/neglected_diseases/resources/WHO_HTM_NTD_2012.1/en/ [Accessed 11 Oct 2018].
. Fourth who report on neglected tropical diseases. Available: http://apps.who.int/iris/bitstream/handle/10665/255011/9789241565448-eng.pdf;jsessionid=C7B9BC21ADCD40A5937D6849C6059C8F?sequence=1 [Accessed 14 Oct 2018].
. Health product research and development fund: a proposal for financing and operation available. Available: http://www.who.int/tdr/publications/r_d_report/en/ [Accessed 11 Oct 2018]. Contributors RZ wrote the first draft of the manuscript which was reviewed by all authors who significantly contributed to the content and approved the final version. Disclaimer The views expressed in this article are those of the authors and may not necessarily reflect those of their affiliated institutions. Data sharing statement All data from this article have already been published and available in the public domain.